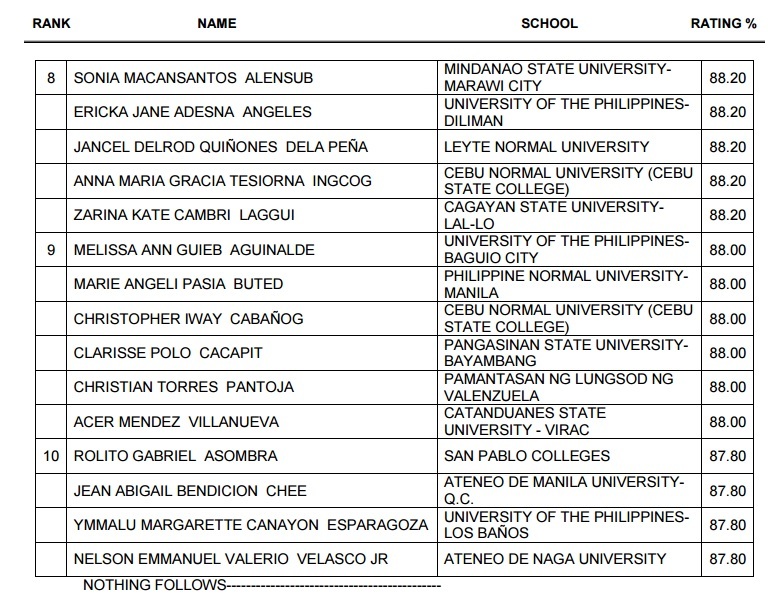 The complete list of topnotchers for September 2015 LET (Licensure Exam for Teachers) also known as Teachers board examination for Secondary Level is officially released by the Professional Regulation Commission (PRC) and the Board for Professional Teachers (BPT) in 48 days after the exam. PRC on Monday, November 30, 2015 announced that 34,010 secondary teachers out of 81,463 examinees (41.75%) successfully passed the Licensure Examination for Teachers (L.E.T.). 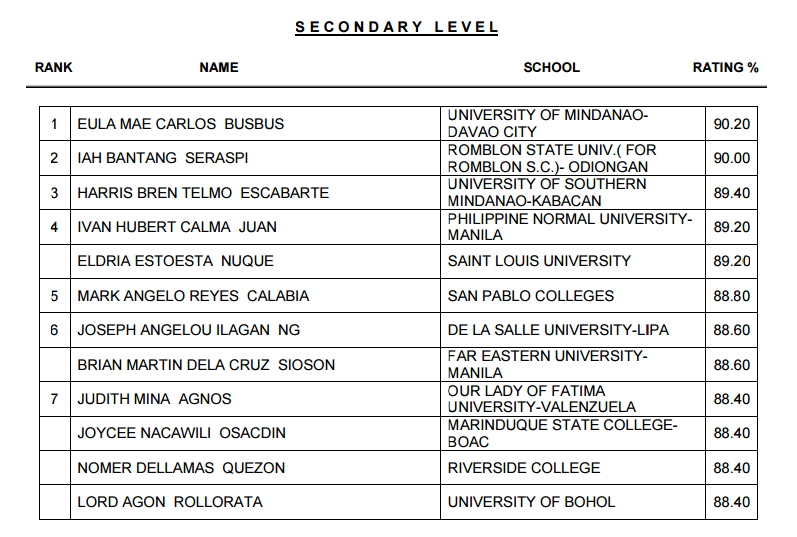 Those awaiting the results for Secondary Level may view here the name of successful examinees who got the highest grades for September 2015 LET board exams. The list includes the rank, school and average rating. More than 140,000 graduates of Education took the licensure exam in different testing centers nationwide: Manila, All Regional Offices, Zamboanga, Bacolod, Rosales(Pangasinan), Palawan, Catarman (Northern Samar), Oriental Mindoro, Masbate City (Masbate), Laoag, Jolo (Sulu) Tawi-Tawi, Antique and in Hongkong. 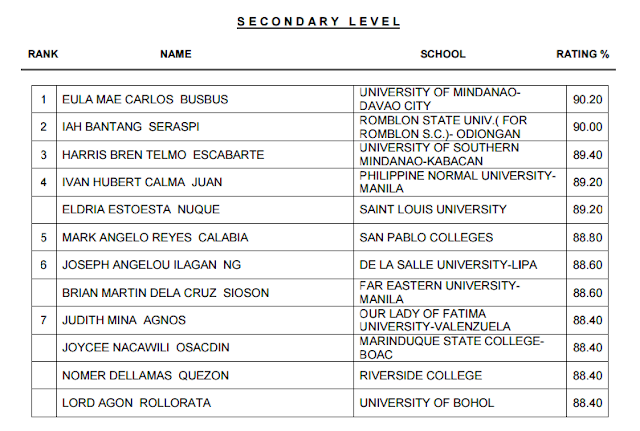 In August 2014 LET, there are 25 topnotchers who occupied the Top 10 list for Secondary level. 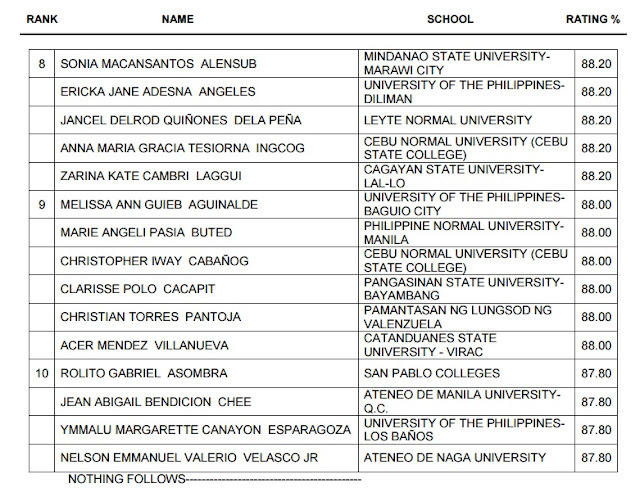 A graduate of Philippine Normal University (PNU) - Cadiz City topped the board with 90.20% grade. It was followed by a graduate of New Era University who got 90.00 percent rating. Like Us on Facebook or Follow Us on Twitter and Instagram to receive relevant updates for teachers board exam.